Think branding is just for businesses? Think again. Branding is for everyone – companies, nonprofits, professionals, pets (just check out the brand created by Grumpy Cat) and yes, even towns and cities. With the rise of the millennial generation, it is even more important for your town, borough or city to have a brand to call it’s own. Most know that I come from a small town, a very small town. 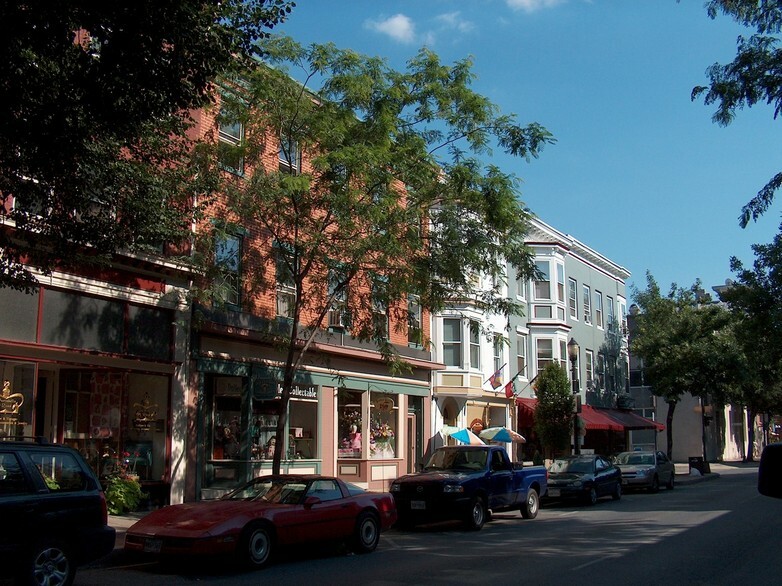 Pittston, Pennsylvania is located in the heart of the Pennsylvania coal fields on the banks of the Susquehanna River smack dab between Wilkes-Barre and more well-known Scranton. Pittston, just like many small towns across the country are seeing a new renaissance but many face the same problems namely the town or borough lacks a brand for itself. In this article we will look at 10 tips on how your small town can create its own brand and guarantee a spot for itself on the digital roadmap. First and foremost, a brand is a perception. It is what people think of you, not what you say you are. However with most town marketing we see the latter circumstance. These towns create a brand based upon based solely upon how they perceive themselves. Its top-down branding and it rarely works. so the first ting you will want to do in developing a brand for your town is to change your mindset and take the administration and its vision out of the picture for the time being. Every municipal government has their idea as to the direction their community will take which is great but, too often that vision was created by only a handful of people. If you proceed down that path I hope your vision falls in line with those of the people you are looking to attract to your town as well as with your current residents. The point of branding is to create an emotional connection and not create a brand based on emotion which many area. One key thing to remember in town branding is not to let local politics kill your branding efforts. Too often a good branding initiative has been destroyed by politics. Someone with political clout has one vision while someone else has another vision and the result is an all-out political war with branding as its first victim. Is this something unique to us and something those we are looking to attract to the community can’t do or get closer to home? What are some of your current assets of your town that you can capitalize on? Will the town’s existing residents buy into it? Will it benefit the town’s current resident’s and how? Is it something that will attract new residents to the community? Is it something that will benefit local business? Is it something that can attract new business to the area? How much will it cost and when will we see a return? Once you have all the research complete, the fun part begins. Development of your actual brand elements. Most towns have seals but don’t use them apart from official stationery. Your seal is your municipality logo so use it! Just check out a number of logos online and you will see that the retro look is coming back and you can’t get much more retro than a municipal logo. It also provided a formal visual element that your residents and visitors can identify with and immediately identifies your website, your Facebook page, etc as being YOUR page and not something setup by a disgruntled residents. My hometown of Pittston City and my adopted hometown of Frederick, MD are both great examples of this. The seals are very formal, and colored so that it pops out. Don’t have a seal or prefer to go in the direction of a logo? Not a problem, many municipalities do. Look at the example of Emerald Isle, NC. 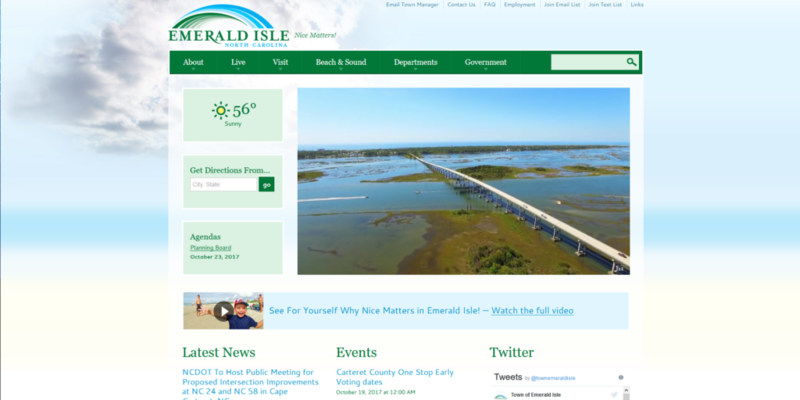 Emerald Isle is part of North Carolina’s Crystal Coast and a tourist beacon in the region. Because of that they moved away from a traditional city seal towards a more logo-type identifier with the name of the municipality and a single visual identifier – in the case of Emerald Isle – a wave to symbolize its beautiful beaches. Once you decide what path you would like to go down in regards to your logo the next step is to develop your color palette. Every great brand has a color or group of colors associated with it. McDonald’s has yellow, Coca Cola has red, Pepsi blue and so on. The same applies to municipalities. Ideally you will want one neutral color (such as a white, black or beige), 2 primary colors and a secondary color. Now this is where things can get interesting. You certainly don’t need a degree in color theory to pick out your palette. I personally like to use a tool such as Colour Lovers for inspiration. The best advice that I can give to you is to think about your town. What is it associated with the most? As an example, my hometown of Pittston is known for its annual tomato festival (it is the quality tomato capital of the world) as well for being located on the banks of the Susquehanna river so for their color palette I selected a white background with tomato red and blue as the main colors to represent the tomatoes as well as the Susquehanna River. Emerald Isle went with a very ocean-focused palette with sea green and blue. Just look at the image of the intercoastal waterway on the homepage. I wonder where they took their brand colors from? These are just two examples but, there are many others. Is your town rural and known for its natural resources? You might want a green, brown or blue color palette. More urban – maybe louder colors such as red, dark blue and very heavy with the neutral colors (check out baltimore’s website). Need help, reach out and we will give you a hand. What do you have that people can’t do or get closer to home? What makes you worth a trip? What sets you apart from everyone else in the area? 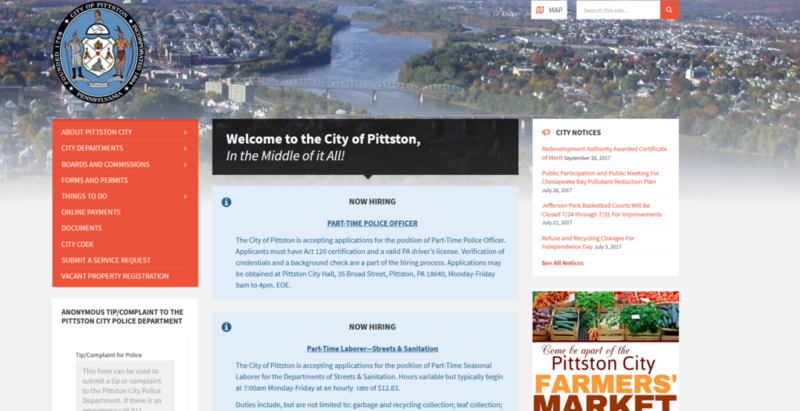 Look at Pittston City. From the outside it is identical to thousands of other small towns across the country – a town that saw its heydays in the early 20th century, built on coal and the railroads and came crashing down once both dried up. Nothing much unique about Pittston. Or is there? 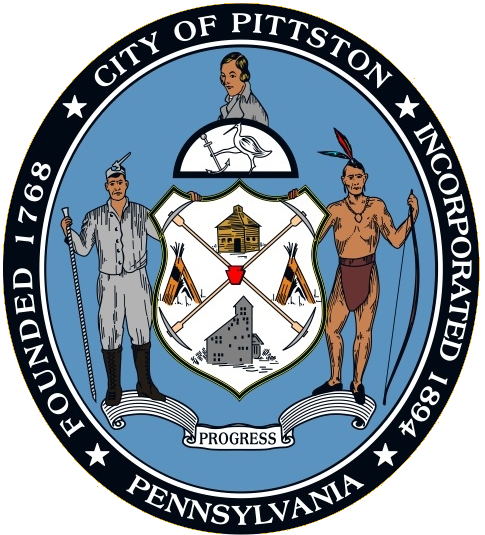 Pittston is located between two major regional hubs – Wilkes-Barre and Scranton. It is also located only 2 hours away from New York City and Philadelphia. Many businesses and people are relocating to Pittston for exactly that reason. Small town living without the high costs of city living. If Pittston wanted a UVP – that may very well be one. Something else Pittston has done is to embrace the arts. It has made a goal for itself to have the most public art per square mile than any other small town in America – a goal it is well on its way to achieving. This has also made Pittston a regional art hub – another UVP. Pretend your municipality was a business, what would set you apart from your competition? This is probably one of the most underlooked areas in town and municipal branding. Every single municipalities has a wealth of visual beauty around them regardless if it is your downtown area, your parks, your buildings, the natural surroundings, etc. They exist but most towns don’t use them for visual elements. They think Facebook or their website is only to be used for posting about council meetings or when trash is going to be picked up or the occasional event. We live in a visual age. If you don’t believe me just look at the popularity of Pinterest and Instagram. There is a reason why photos are the most popular and shared type of post on the social networks. Every website should have photo gallery functionality so people can see the beautiful photos of your area and each of those photos should have the ability to be pinned to Pinterest and shared. Photos can be uploaded in a matter of seconds and they allow something visual that your visitors can connect with, something your residents can see an appreciate the beauty of their town and something you should have great pride in. Take a look at the photo of downtown Frederick, MD at left. Frederick uses this photo as well as many others on their digital platforms. You can imagine yourself walking down this main street on a sunny weekend afternoon and that is exactly the type of emotional connection you want to create. Check out some of the top brands out there. You will photos of the people in the offices, the buildings and offices themselves. You will find photos of literally everything. A good municipal brand needs visual elements to help make the brand pop. They reinforce your brand and become great assets for you to share on your collateral and social networks. Don’t have any visual assets available? Grab your smartphone and go out on your lunch to get some or create a Facebook page and ask your residents for some of their photos. Many would be only too happy to oblige and use these photos online, on your social profiles as well as your marketing collateral. 360 immersive videos and tours are gaining in popularity and are a great way to really boost your brand. Give a 360 tour of your main street, city hall or your parks. You would be surprised how popular those tours would be. Printed stationery and collateral are the traditional standard bearers for your town branding. They are usually the only thing that has any branding associated with them at all and usually it includes just your municipal seal. Once you complete your new branding – your new seal/logo, your color palette, etc. You need to begin utilizing them on your printed collateral. Most municipalities go the inexpensive route and just put their seal in the header of a document and print copies. Yes, it is inexpensive but it is also boring and looks cheap. A good municipal identity kit will allow you to keep your brand consistent throughout your collateral as well as provide everything you need for your printed collateral and forms. These forms are your business cards as I guarantee you give out more forms then you do your own municipal business card so they better look just as good. It portrays your municipality as professional and consistent with its branding. I’ve seen many municipal forms that have simply been in the photocopier too long and were barely legible. Your town deserved better and it goes a long way to reinforcing your brand. In many cases it is one of the first ways you can show off your branding. Think of yourself as a business and of your branding as all encompassing – do you think businesses spend thousands of dollars on branding and not use it on their collateral? Let me say this very clearly, it is the 21st century. You absolutely need a website. Its is expected, it is required and there are no excuses you can make as to why you don’t need one. Just think of it this way, the millennial generation grew up with high-speed internet and computers. Do you really think they won’t be expecting you to have a website? Having a website is crucial to your town branding because in many ways it is the foundation of your branding as well as its chief reinforcement agent as it is the main way people will be introduced to your brand. Now, I will answer the first question that immediately comes to mind. “How can we have a site when they are so expensive?” My answer to that is this. If you are using an agency that is charging you $10K for a simple site than you are simply looking at the wrong agency. Websites are incredibly affordable if you are using the right agency (such as MarketingModo which not only creates your site but can also manage it for you). It is more expensive not to have a site than to have one in this day and age. A modern brand requires a website. You want your brand to show how forward thinking your municipality is. Not having a brand severely hurts your brand as it hurts your credibility to the modern 21st century audience. You will want to make sure that you are using your logo/seal as well as your color palette in your web design. I’ve seen many municipalities with great branding but used none of it on their site. Don’t make that same mistake. Look at the two sites below and tell me which has their brand strategy which doesn’t. Just as a website is a requirement for a modern town brand, so is a presence on the social media networks. Now you don’t have to go all out and join everything but I would highly recommend the top networks such as Facebook and Twitter at the bare minimum. Most of your residents have profiles on these networks so it is one of the most effective channels, outside the website, to reach them with your news, events and updates. The key is to integrate these networks with your website so you have a seamless brand experience from one platform to the other so you will want to make sure to use the same brand elements we created in steps 1-4 on your social media profiles as well. And remember, the social networks are all about engagement so make sure to have engagement on those channels rather than one way communication – ask questions, post contests and photos, drive engagement with your brand. Boroughs, towns and cities across the country are branding themselves so they can grow in population as well as commercially and culturally. Following the 10 tips above to brand your small town or community will give you the advantage and headstart your community needs to create a unique brand that will benefit the municipal government, the town’s resident’s and businesses as well as prospective businesses and residents, it is a lot to do. Turn to a trusted such as MarketingModo. With over 10 years building brands for towns of all sizes, we will help you build the brand your town needs.